Free Book Giveaway: Comment to WIN! Every comment posted to Crowded Earth Kitchen between now and June 15th counts as one entry. Join the conversation – we look forward to hearing from you! Promise Lodge is a delightful novel. 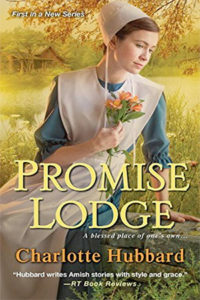 In Promise Lodge, Charlotte Hubbard spins a tale of sisterhood, independence, empowerment, and faith as three Amish women set out to establish a new community. At Promise Lodge, community members will be free to blossom, regardless of their age or gender. Readers will fall in love with the vision and determination of Mattie, Rosetta, and Christine. Readers will cheer for a second chance to unfold between Deborah and Noah, and will fond themselves turning over the wisdom of Preacher Amos as they eagerly turn each page. Readers who like to dabble in the kitchen will be delighted to know that Charlotte Hubbard includes mouthwatering recipes from Promise Lodge at the end of the book! Happy Reading… and Happy Cooking! Can’t wait for the contest to end? You can purchase your own copy of Promise Lodge right here! This entry was posted in Books, Contests and tagged Amish, Books, Contest, Cooking, drawing, fiction, Food, Free, Freebies, Giveaway, Reading, Recipes. Bookmark the permalink. Looking forward to reading Promise Lodge. I love book giveaways! Shared it on Facebook for you ! I enjoy books with the Amish at its core. I also like when authors include recipes in their books. Hubbard is a new to me author. I look forward to reading Promise Lodge! Sounds like a good summer “by the pool read”. I love books with recipes included. I’ll bet they’re tried and true old time Amish cooking! Carly Ellen wherever you are, I’m here because of you! What a wonderful sounding read! And recipes? A terrific extra touch that really adds to the story! Love to find books about women with strength.